I had never heard of a Dark and Stormy before last year when I jet setted to Bermuda...and now I feel like I am seeing them on drink menus everywhere. 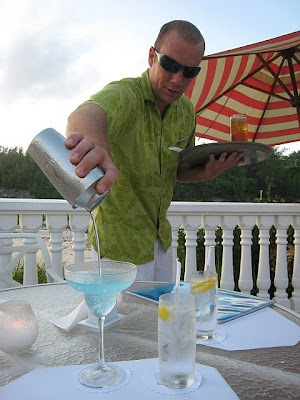 (see picture above of waiter in Bermuda- it's the drink on his tray, not the one he's pouring) Anyway, I know it's a classic drink and many of you may be thinking that I'm crazy to have not known it. Either way, not only do I now know about it, but I also know that it's pretty easy to make. I wanted to share the recipe with you all if you are inspired to make a Sunday cocktail.